Nice job! Is the Airflow mounted to the stock ’14 screen or the ‘touring’ screen? You stated the Airflow came from your 650, is that the AF3101? Someone posted that Givi is coming out with a specific Airflow for the ’14 (AF3105??) but I can’t find it in retail yet. I think I would do what you did, rather than wait. I have used the original (not the touring) screen. The Airflow from my 650 was the AF3101. I was Thursday at Givi for the new suitcase rack (view other topic) and told me that the Airflow for the V-Strom 1000 L4 comes next month. 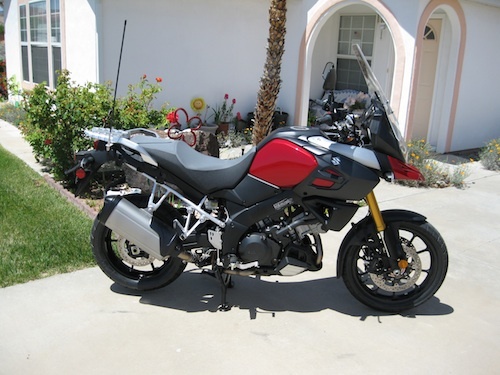 I just bought the adventure version, it has the taller windscreen, I found no issues with buffeting, the airflow felt fine over the helmet, i'm 5'11 225lbs. I just purchased a new candy red 2014 DL1000. Just the ride from the dealer to home cured me of the stock windscreen. I called CalSci and they said it would be at least six months before they got anything out for the new bike. So, I got my tools out and built myself a new windshield. I started with a 21"X21" piece of 3/16" Plexiglass and cut it out with jig saw and bent it with a heat gun. I secured it with nylon and neoprene washers against 3/4" pieces of weather strip onto the stock brackets. Due to bad weather, I have only had it up to 40 MPH but it blows the air well over my head and I am 6'1" tall. Hope I can get it out on the highway in the next couple of days and see what it does at 75 MPH. I would show some pics but I see that we can no longer load them up from our computers. Don't know why that was changed. Hi peter. I am new to the site. 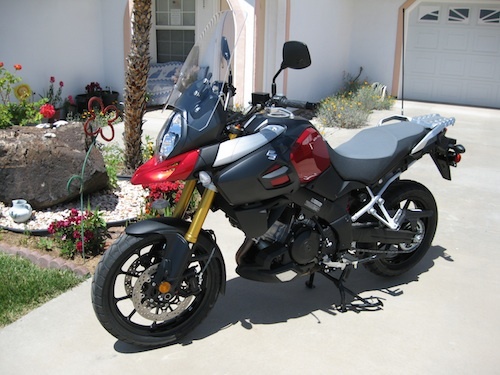 I have just got my new vstrom the first one that I have . 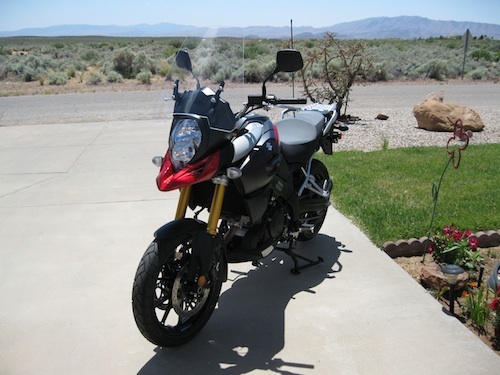 I had a new Busa and traded it in for the new vstrom. The only thing I don't like is the wind hitting my helmet so I got the touring screen and that was not doing the job. So I have orded a new 650 airflow and I am going to do the same as you. Cant weight for one to come out. In New Zealand they say only by September.Apart from the wind I am 1.82 m tall the bike is great . I got the first black one in Christchurch and they have sold three since they came out 3 weeks ago. I have done 1500 klm since I got it. Last edited by DVosloo; 04-28-2014 at 01:07 AM. My long ride yesterday served up some answers for me. Oddly, the best position for the screen was the all the way back one. My new Shoei handles streamlining the wind quite well but with anything other than all the way back, I had a nice vibrating buffet. The Shoei also seals at the neck quite well but without earplugs well buried in my ears, the wind noise was still loud. Today I am going out with the windshield mounted on the lower screwholes but I can't see it making much of a difference. After the big screen on the NTX I guess I'm spoiled enough to look for another. Has anyone tried the MRA touring X-creen? Do the brackets sit attach to the flared top of the screen alright or does it have to be mounted below the flare, thereby losing half the height? Moved the screen up on the top mounting holes. Made a tiny bit of difference and yesterdays's fast ride didn't bother me a lot so I might stick with it for a while. High wind noise, tho. Even with ear plugs. I had a chance to take a 65 mile ride with the new windshield yesterday. It was really windy so it gave me a chance to really wring it out. The new shield worked great. It throws the wind well over my head at all speeds from slow all the way up to 75 MPH. The air flow is pretty calm except in cross winds but that is true with all shields. I showed it to the dealer where I bought the bike and he couldn't believe I made it. It'll work until I get a CalSci touring screen when they get up to speed. I'll try to post some pic here and see how it works. Haven't done this link stuff before. Last edited by Jim Judd; 05-07-2014 at 03:51 PM. I finally got a chance to give the home made windshield a good highway test. All the way up to 75+ it is pretty much buffet free. The wind goes well over my head at any speed. It would probably do a little better in crosswinds if I had made it just a little wider, but it is still really good. Took a 100 mile loop through all kinds of roads from city streets to freeway. Averaged 55 MPG!